This challenge, your 48th, goes out to all the urban mamas who need a scavenger hunt for the day. 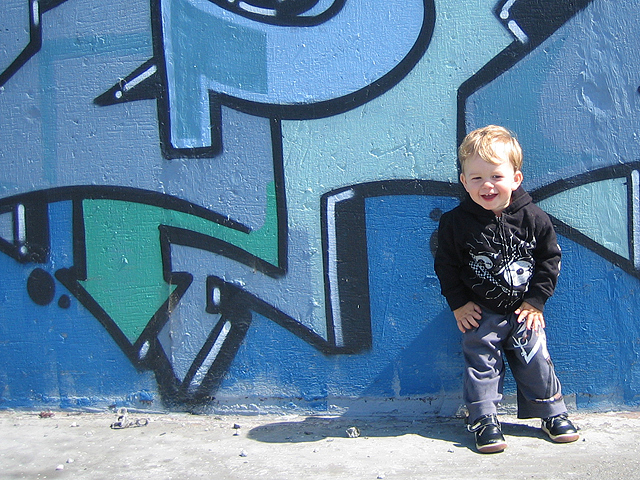 Take a picture of your baby in front of graffiti – as explained by Dutch, the dad who writes on Sweet Juniper. He has an awesome set of Flickr photos that inspired us to do this. We set out to find the best graffiti in Berkeley and packed up the boys and our cameras. Sometimes the best street art is at the railroad tracks or near the highways, so bring a grown-up friend to turn the assignment into a fun adventure. Please share your attempts here in our comments or on the Rookie Moms Facebook page. If you have any tips on getting your kid to stay put while you take the pictures, let’s hear them. Too cold outside? Your baby too young? Choose another challenge. Ooooh, I love Sweet Juniper! He’s a fantastic photographer and writer! I would really appreciate your help! thanks and best of luck with motherhood and blogging.